And come tailgating season, you’ll fall in love all over again. There are no shortage of articles floating around the Internet this time of year listing off all of the essential kitchen items you ought take with you to a vacation rental. It may seem cumbersome, but yeah—in order to have a smooth, relaxed cooking experience in your (likely poorly stocked) kitchen-away-from home, it helps to take a few pieces of trusted gear. No doubt, these sorts of packing lists are thoroughly informative and helpful for those who’d prefer to cover the majority of their vacation meals by cooking up something simple and delicious at home (versus heading down to the local strip of fried seafood shacks), but there’s one fairly essential item that’s typically left unaddressed by these lists: the grill. Whether you’re at the beach for a week, heading to a buddy’s lake house for the weekend, or making the annual family camping trip, most summer vacation adventures would be infinitely better with a variety of smoky, grilled goodness being a prominent part of the experience. And that is why we need to talk about Mr. Steak. A wide variety of cooking products and tools come across my desk each week, and while the MyRecipes team can’t try them all out (nor do we necessarily want to), we do try to give attention to those we think might actually be useful or exciting for our readers. And given the fact that we’re right up in summer vacation/grilling season, and with tailgating season around the corner, this portable infrared grill—which despite its name, gracefully handles far more than steak—seemed to really fit that bill. So we teamed up with one of our test kitchen chefs, Julia Levy, to put the Mr. Steak Portable Grill through its paces. Levy unboxed and evaluated the 1-burner Mr. Steak (there is also a 2-burner model available), using it to prepare a variety of simple grilled foods including burgers, steak (duh), assorted summer vegetables, chicken breasts, a whole fish, and shrimp. Here’s what we thought. Obviously, everyone has their own interpretation of “heavy,” but I’ll say, we didn’t find Mr. Steak to be surprisingly lightweight. That said, it’s a grill… you generally want that to be a hearty piece of equipment. And compared to other portable grills I’ve seen, Mr. Steak feels manageably compact and isn’t awkward to transport. Levy notes that you probably wouldn’t want to be the person charged with carrying this thing for much of a distance, but is easily transported in a vehicle. The grill is simple enough to assemble, but Levy found that she did need more than one set of hands—so on your initial voyage with Mr. Steak, be sure to grab a buddy. All in all, we found Mr. Steak to be smartly designed and especially ideal for a tailgate or stationary campsite. Levy also mentions that this would be an excellent tool to have for an apartment, home, or vacation rental with limited outdoor recreation space, as you could simply store the grill indoors or cover when finished. The grill has very even heating, which is ideal for burgers, chicken, fish fillets, etc. No indirect heat setting means something like a whole fish would need to be cooked in a foil packed over low-ish heat, or sliced into fillets. 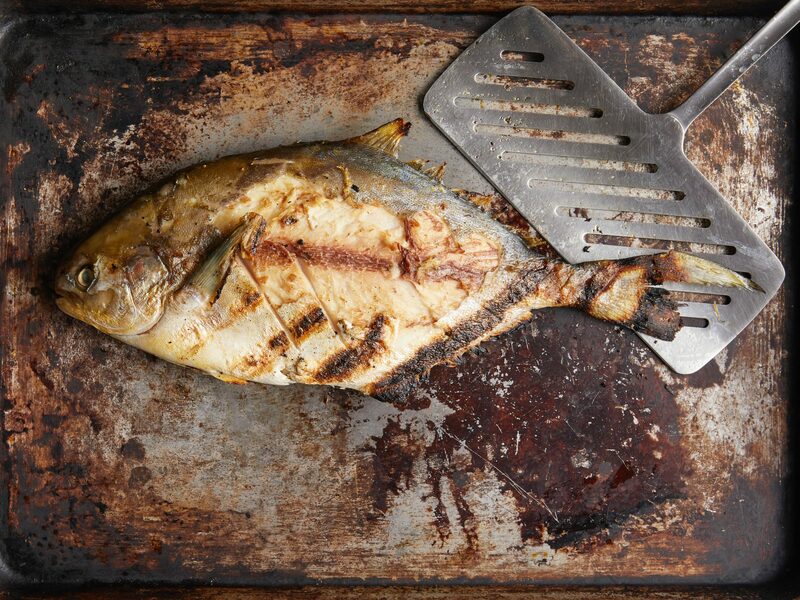 With the exception of the whole fish’s skin, nothing stuck to the grill! It was so nice! 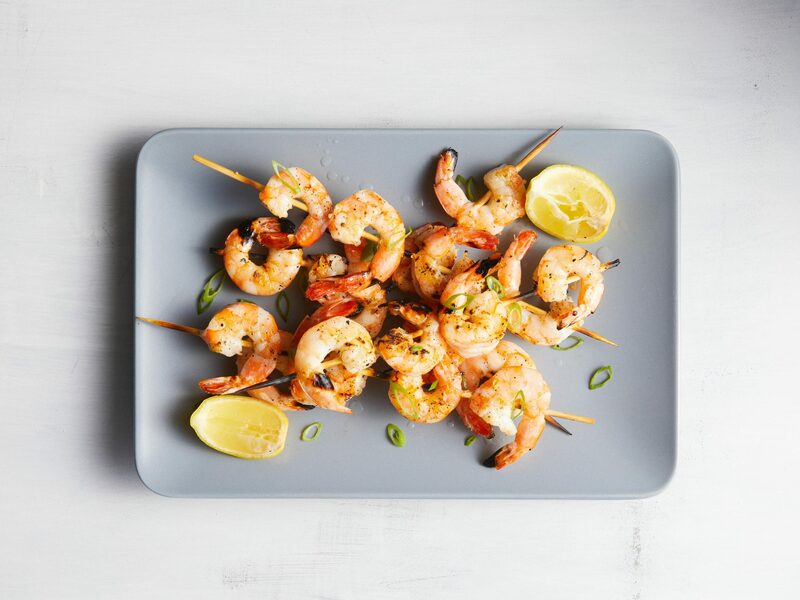 Loads of great signature grill flavors infuse into the food, even with short cooking times. You’re not compromising any smoky char here. 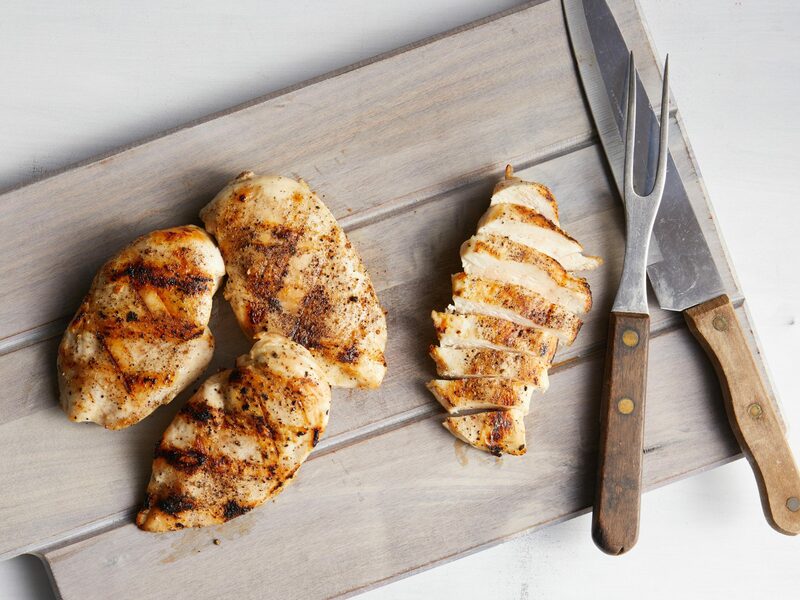 It leaves GREAT grill marks. The grates are wide enough that onions don’t fall through… which is kind of a miracle. There is no way to close the propane when attached to the grill—it must be removed when finished grilling. The lid latch gets really hot when grill is on, so you need to use your tongs or other utensil to undo the latch when closed—it’s easy enough to do, just be aware that it’s HOT. In case there’s any doubt, this grill MUST BE USED OUTDOORS. Pros: The grill’s grates and appendages are super easy to remove for thorough cleaning, and the outside of the grill is easily wiped down warm a damp cloth or cleansing wipe after use to keep Mr. Steak looking as handsome as ever. 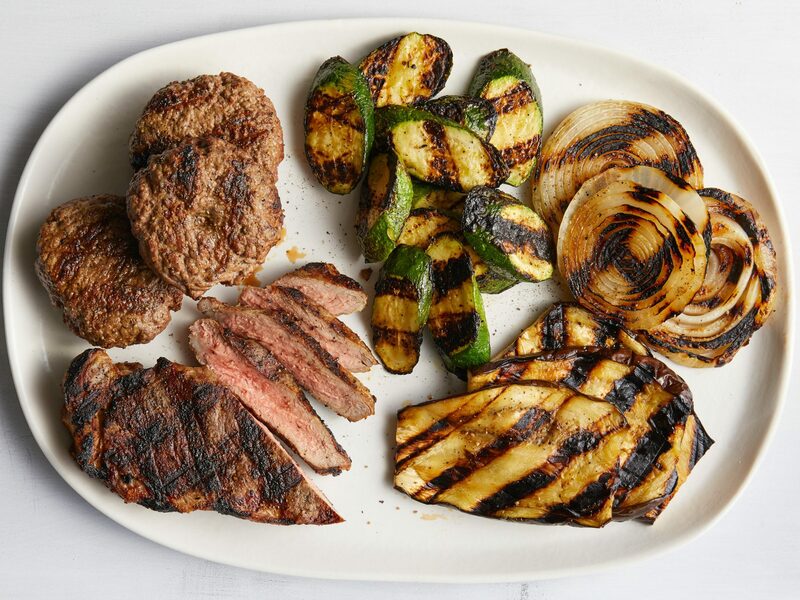 Cons: The shiny stainless steel grates blackened immediately upon coming into contact with food; and while charred residue is a perfectly normal part of grilling, Mr. Steak’s grates are not the easiest to scrub clean… at least not to their original glory. That said, if you’re a fairly laid back human being who’s OK with your grilling equipment not maintaining all of its new-from-the-box sheen, you should be just fine with a Brillo pad and some muscle. Conclusively, if you’re in the market for a grill that’s ready and set to join you on your outdoor adventures and festivities, the solid and reliable Mr. Steak has your back. The Mr. Steak Infrared Portable Grill retails for $230 for the 1-burner model and $330 for the 2-burner, and can be purchased exclusively from Bass Pro Shops and Cabela’s—online or in-stores nationwide.